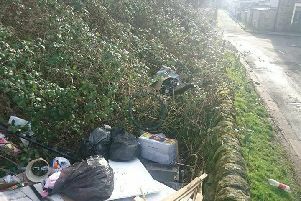 There were over 3,000 cases of fly-tipping in Burnley. New figures from the Department for the Environment, Food and Rural Affairs (DEFRA) have revealed that Burnley Borough Council spent almost £170,000 on cleaning fly-tipping sites over the past 12 months, prompting an agricultural expert to warn of the "hidden cost" of illegal dumping. With more than one million documented incidents of fly-tipping across the UK in the last year, councils across the North West themselves spent over £9m on cleaning up the refuse from such crimes, as the number of cases showed a 9% increase from 12 months ago to reach a lofty total of 128,193 reported incidents between April 2016 and March 2017. With January upon us, councils are likely to see a surge in flytipping as rogue residents and traders dump post-festive waste - including old Christmas trees - with the newly-released figures from DEFRA show that fly-tipping costs the UK taxpayer £58m per year, with £9,247,374 being spent on cases in the North West. Burnley had 3,101 cases of fly-tipping, costing the council £167,949 and making the area the 11th-worst offending borough in the North West having ranked just third behind the larger cities of Manchester and Liverpool in 2015/16. Highlighting the plight of farmers, who often fall prey to the crime at an average cost of £1,000 per incident and who are also liable if the dumped rubbish damages the countryside, William Nicholl, head of insurance specialist Lycetts’ rural division, said: “Farmers are well aware of this issue and are saddened by the visual impact it has on the countryside, as well as it being a nuisance and inconvenience when trying to get on with their jobs. “With many authorities looking at introducing charges for bulky waste and organic waste collections and charging for dumping waste at council-run tips, there is a fear that flytipping incidents on farmland will increase," William added, stressing the importance of having sufficient protection for farming businesses, particularly in the case of repeat offences. “If farmers are unfortunate enough to have a flytipping ‘hotspot’ on their land, costs soon tot up and their business could be put in jeopardy," he said. “Farmers are not only having to fork out for clean-up costs but are having to worry about the damage it can cause to workers and their animals. Flytipping can affect every part of their livelihood."